CARPET and wooden furniture maker Mustafa Furnishing Industries has announced plans to diversify into gypsum board manufacturing with an eye on exports. The company said in a statement it will set up the factory in the Sharjah Airport Free Zone (Saif Zone) by the end of next year to produce gypsum panels which are extensively used in the construction industry in the region. Mustafa Furnishing was launched in 2004 and specialises in manufacturing wooden furniture and carpets while also trading in the two segments. Waseem Ahsan Chaudhary, managing director and owner of the group, said: “Construction of the new factory will begin within two months and production will commence by the end of 2015. Gypsum boards offer an alternative to wood for applications including ceilings, insulation and partitions, he said. “It is known as the green material of construction. The production of gypsum boards will help in the replacing of wood and thus, the project will have a positive impact on the environment. 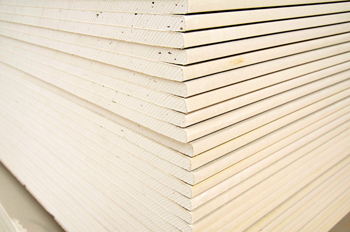 Gypsum boards facilitate faster installation and reduce construction costs. The product is recyclable and environment-friendly and clearly better than other construction material as it reduces the weight of the building and consumes less space,” Chaudhary added.